This large Mexican tin nicho with glass panels is ideal for displaying traditional religious statues or devotional items. 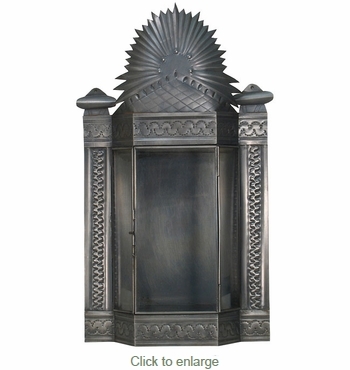 The cut and etched Mexican tin work designs will compliment any Spanish colonial or Mexican religious theme. All of our aged tin nichos are authentic creations handmade by artisans in Mexico. Expect some variations in color, design and size.